+971 54 444 6088, P.O. Box 120961, Dubai, U.A.E. The PADI Scuba Diver course is a subset of the Open Water Diver Course. This course can be completed in as little as 2 days, perfect for those with a limited time frame and will still give you a fulfilling PADI diving experience. PADI Scuba Divers are trained to dive under the direct supervision of a PADI Divemaster, or PADI Instructor, to a maximum depth of 12 meters. 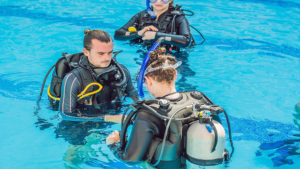 PADI Scuba Divers have more theoretical background and better-developed water skills than PADI Discover Scuba Diving participants; however, they are not qualified for independent diving. PADI e-manual & PADI Certification card. Orca Dive Centre log book. *Note: 10-14 year old divers earn a Junior Scuba Diver certification. 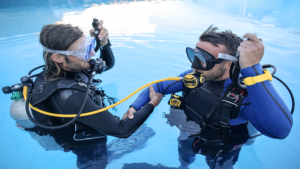 We conduct the course over two days and like the PADI Open Water course, the program consists of three separate sections. Start Now! Earn your first PADI certification! The PADI Open Water Diver course is the world’s most popular scuba diving training course, giving you a license to scuba dive anywhere in the world. Every year, over half a million people worldwide have got their PADI, with training conducted at thousands of dive sites around the world. Orca Centre Dive log book. *Note 10-14 year old divers earn a 'Junior' Open Water Diver certification. Knowledge Development – conducted in our classrooms. Confined water training – conducted in our shallow beach waters. Open water training – 4 x Open Water training dives conducted off one of our dive boats exploring the amazing coral reefs and marine life around Dibba Wreck. The mission of Orca is to assist the experience of water sports in the safest and most thrilling way possible, with terrific and impressive coaching as well as equipment hire. © 2019 ORCA. All rights reserved.